Organisers of a crippling 38-day anti-inflation strike in the French island of Martinique lifted their protest Saturday with the signing of a protocol with the government. "This protocol will mean the lifting of the strike call," said Michel Monrose, head of the February 5 Collective group which launched the protest. But he added the Collective "reserves the right to re-launch the strike if the accords are not respected". The signing ceremony drew a crowd of thousands who gathered outside the island's head administrative office. They repeatedly chanted a slogan "Matinik leve," or Martinique stand up in the local Creole language. 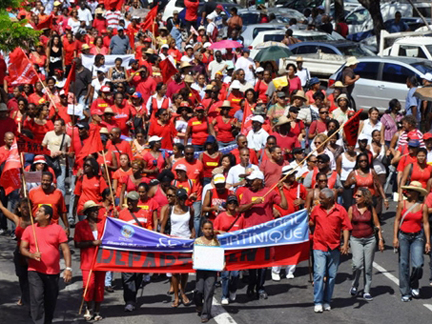 The Caribbean island, about 7,000 kilometres (4,350 miles) from Paris, has been paralyzed for over a month by strikes and protests against the high cost of living, with a similar strike in neighbouring Guadeloupe resolved earlier. Unemployment on the island stands at 23 percent, while most of its food products, shipped in from France are very expensive. The unrest has also sparked tension between the island's black majority and the local whites -- descendants of former colonisers and slave traders -- who control a large part of Martinique's economy and retail trade.